alaTest has collected and analyzed 30 reviews of Flip MinoHD. The average rating for this product is 3.9/5, compared to an average rating of 4.1/5 for other Camcorders for all reviews. Reviewers really like the reliability and design. The price and portability are also appreciated. Some have doubts about the size and memory. We analyzed user and expert ratings, product age and more factors. Compared to other Camcorders the Flip MinoHD is awarded an overall alaScore™ of 87/100 = Very good quality. 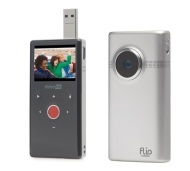 We reviewed Flip's original Mino camcorder in What's New, Shopper 254. The Flip MinoHD is a top-of-the-range piece of movie-making equipment that does a lot without flaunting it. Although ultimate image quality and features are sacrificed on the altar of price and pocketability, the MinoHD should be on casual videographers shortlists. We go hands on with the most popular solid state HD camcorder, just launched in New Zealand.